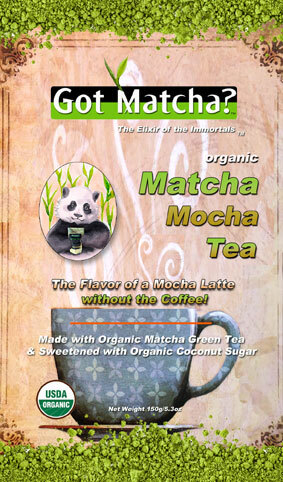 Introducing our Matcha Mocha ! Dreaming of escaping to a French café and sipping a delicious cup of café au lait as you gaze at the Eiffel Tower and enjoy the creamy Mocha flavor in your cup? Welcome to le Café Matcha! Sometimes dreams DO come true. Imagine if you could have your coffee cake and drink it too. Now you can thanks to Got Matcha’s new Haute Couture collection … the Café Mocha. Now there is a true superior alternative to coffee in both flavor and energy! Perhaps you’ve already given up coffee and miss that heavenly aroma of freshly brewed beans in the morning, or maybe the idea of giving up your morning cup o’ Joe is horrifying despite the fact that you know it would be better for your health. You may already be a convert to the wonderful world of Matcha, but, let’s face it, while the benefits of Matcha green tea put coffee to shame and the Matcha green tea latte blends are indeed delicious, nothing can replace that authentic coffee taste. Until now, that is. Got Matcha has managed to combine the flavor of coffee with the benefits of matcha green tea, to bring you the most delicious alternative to coffee. Got Matcha’s signature blend of chicory, barley, cinnamon, carob and select spices create a subtle mocha flavor with an energy and antioxidant boost à la Matcha. 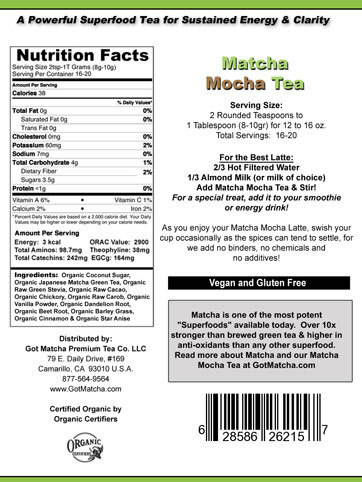 Got Matcha’s Café Mocha not only provides long-lasting energy, but it also aids digestion and cleanses the body of toxins naturally. Voilà! Here are some of the many amazing matcha health benefits of this new treat. You may feel like you’re indulging, but this is the healthiest indulgence around. Coconut Sugar: Coconut Palm Sugar is naturally low on the Glycemic Index (GI), which is important to those who are concerned about weight control and diabetes. Coconut Palm Sugar is rated on the glycemic index at 35, whereas honey is 55 and typical cane sugar is 68. The low glycemic index of coconut sap sugar is especially helpful as a healthier alternative to those who are pre-diabetic and/or diabetic; unlike all sugar cane based sweeteners (refined white sugar, brown sugar, muscovado sugar, turbinado sugar, demarara sugar, sucanant sugar, molasses and dehydrated cane juice sweeteners) --- all of which have a high glycemic index rating between 65 to 100 per serving! Coconut Palm Sugar also has a nutritional content far richer than any other commercially available sweetener. It is particularly high in Potassium, Magnesium, Zinc and Iron. It is also a natural source of vitamins B1, B2, B3, B6 and C.
Matcha: Increases thermogenesis in the body, becoming a potent appetite suppressant and increasing fat oxidation. This in turn helps the body to use fat as an energy source. Japanese researchers have found that green tea consumption can lead to lower mortality rates in humans. Matcha benefits the cardiovascular system...Protects against heart disease; among which would be: vasculoprotective, antioxidative, anti-inflammatory and cholesterol-lowering. Recent evidence suggests that drinking green tea can reduce the risk of Type 2 diabetes! Cacao: ground up raw cacao beans are considered a superfood that is nutritious, rich in antioxidants, minerals such as iron, vitamins, and even 6 mg of protein per ounce! So, the takeaway is that if you eat dark chocolate in its natural state, there is absolutely nothing to feel guilty about. Chicory Root: Chicory is A popular herb that is used as a caffeine-free alternative to coffee providing similar rich flavors to coffee. Chicory has been around for centuries...Ancient Romans used the herb to help cleanse the blood. Egyptians consumed chicory to help purify the liver and the blood. Chicory is Also a great source of antioxidants, is anti-inflammatory and even has anti-fungal properties. Dandelion Root: Has been used to support the liver, increase energy and health and has antioxidant and anti-inflammatory properties. Improves bile production which stimulates the digestion of fats while also transporting toxins out of the body. Beet Root: Linked to improved heart health, increased energy and stamina, lower blood pressure and improved blood flow. Romans used it for constipation, skin problems, fever and other ailments. Also rich in potassium, iron, vitamins, antioxidants, fiber, protein and other minerals. Anise: Has antiviral properties, boosts immune system, is anti-fungal (great for Candida) and high in antioxidants. For an authentic Mocha green tea latte, warm some almond, hazelnut or coconut milk in a saucepan over the stove and let warm slowly. Add 2 teaspoons – 1 tablespoon of your Café Mocha powder and stir. Pour into a mug and sip slowly as you close your eyes and imagine yourself back in that French café indulging in a warm, comforting Mocha matcha latté without a care in the world.